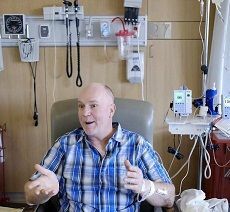 The revolutionary cancer destroying therapy that coerces patient’s own disease fighting immune cells to fight Chronic Lymphocytic leukaemia has shown encouraging results in few people promising to end the use of chemotherapy. The approach that has been developed by the University of Pennsylvania’s has shown remarkable results with one patient living cancer free five years after the start of the treatment and two others showing no recurrence of cancer for the last four and a half years. Patients who experienced complete remissions showed that the modified cells remain in patients’ bodies for years after their infusions, with no sign of cancerous B cells. Normally, the immune system tries to attack cancer but fails, as cancer can evade the body’s defences. In this fascinating new approach the body’s killer T-cells are modified to contain a protein known as a chimeric antigen receptor (CAR), which targets the CD19 protein found on the surface of cancerous B cells. After the immune cells are collected and modified, the patient undergoes chemotherapy to wipe out their current immune system before they are re-infused with their newly strengthened immune cells. The approach shows long term cancer fighting potent as it has the ability to clean out cancer cells for years. More tests and are needed to establish the reliability and validity of the approach but it sure assures a new era for chronic lymphocytic leukaemia. Endoscopic Surgery Helps New Born Survive from a Life Threatening Condition.